Skeletal mount of a Columbian mammoth at The Mammoth Site in Hot Springs, South Dakota. Photo by Dave Smith, UCMP. Mammoths were first described by German scientist Johann Friedrich Blumenback in 1799. 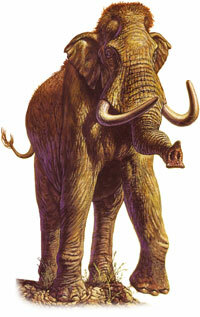 He gave the name Elephas primigenius to elephant-like bones that had been found in Europe. Both Blumenback	and Baron Georges Cuvier of France concluded, independently, that the bones belonged to an extinct species. 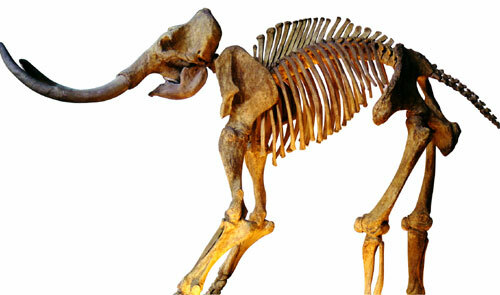 The bones belonged to the woolly mammoth, later considered to be a distinct genus, and so renamed Mammuthus primigenius. A restoration of a Columbian mammoth. Art © 1992 by Mark Hallett. In the early Pleistocene, about 1.8 million years ago, M. meridionalis took advantage of low sea levels (during an Ice Age) and crossed into North America via a temporary land bridge across the Bering Strait. The southern mammoth then radiated throughout North America. In the Middle Pleistocene, a new North American species evolved, the imperial mammoth, M. imperator (though some question whether M. imperator is a legitimate genus). Then, in the Late Pleistocene, the Columbian mammoth, M. columbi (also known as the Jefferson mammoth, M. jeffersoni), appeared. Its range covered the present United States and as far south as Nicaragua and Honduras. Back in Eurasia, another species of mammoth, the steppe mammoth (M. trogontherii), lived from 200,000 to 135,000 years ago. And later in the Pleistocene, the woolly mammoth (M. primigenius), which incidentally was the smallest of the mammoths, made its debut. With the advent of another Ice Age and low sea levels lasting from 35,000 to 18,000 years ago, woolly mammoths were able to enter North America via a new land corridor across the Bering Strait. Woolly mammoths’ southern migration extended as far south as present-day Kansas. Dwarf forms of mammoth are known from fossils found on islands: M. exilis from California’s Channel Islands stood only about four to six feet at the shoulder. Many believe that mammoths disappeared because of a change in climate, disease, hunting by humans, or perhaps some combination of these. It is still something of a mystery. From the preserved dung of Columbian mammoths found in a Utah cave, a mammoth’s diet consisted primarily of grasses, sedges, and rushes. Just 5% included saltbush wood and fruits, cactus fragments, sagebrush wood, water birch, and blue spruce. So, though primarily a grazer, the Columbian mammoth did a bit of browsing as well. The bones of fossil mammoths and mastodons can often look very similar  they are best differentiated on the basis of their teeth (compare mammoth and mastodon teeth by browsing the images at The Paleontology Portal). While mammoths had ridged molars, primarily for grazing on grasses, mastodon molars had blunt, cone-shaped cusps for browsing on trees and shrubs. Mastodons were smaller than mammoths, reaching about ten feet at the shoulder, and their tusks were straighter and more parallel. Mastodons were about the size of modern elephants, though their bodies were somewhat longer and their legs shorter. The San Diego Natural History Museum has a nice page on the American Mastodon.